"Be ready! Be fully dressed and have your lights shining. Be like servants that are waiting for their master to come home from a wedding party. The master comes and knocks. The servants open the door for the master. Those servants will be blessed when their master comes home, because he sees that his servants are ready and waiting for him. I tell you the truth. The master will dress himself for work and tell the servants to sit at the table. Then the master will serve them. Those servants might have to wait until midnight or later for their master. But they will be happy when their master comes in and finds them still waiting. Remember this: If the owner of the house knew what time a thief was coming, then the owner would not allow the thief to enter his house. So you also must be ready! The Son of Man will come at a time when you don't expect him!" Jesus had just urged his disciples to invest in things that are eternal (see the previous verses). Now he reminds them to be ready for the beginning of this eternal future. His coming is near, so be ready. His coming will be unexpected by many, so be ready. In addition, there is a great blessing for those of us who are looking for his coming and are ready for his return. Are you ready? 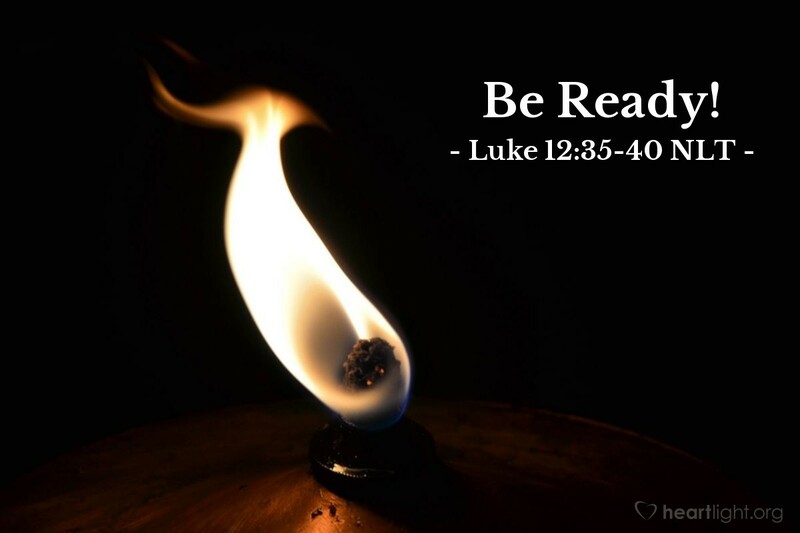 Father, give me a greater sense of urgency and expectation about the coming of Christ. I want to be ready and to greet that day with joy and celebration even though I can't know the day or hour of his coming. Give me wisdom as I try to invest in eternal things that matter to you. Give me courage to live with purity and holiness as I seek to offer myself to Jesus as one prepared for his coming. Give me a sense of joyous anticipation as I await my Savior and the blessing of his glorious return and his ultimate victory. In Jesus' name I pray. Amen.